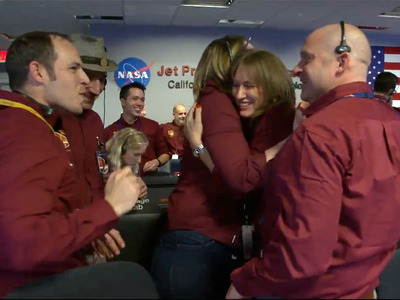 NASA JPL/YouTubeNASA scientists and engineers celebrate the landing of the InSight Mars probe. NASA’s InSight lander touched down on Mars on Monday afternoon after a nearly seven-month trip to the red planet. Scientists burst into cheers at NASA’s mission control in California, hugging each other and engaging in wild handshakes. The spacecraft is set to study the interior of Mars over the next two years, taking the planet’s temperature and checking for quakes. 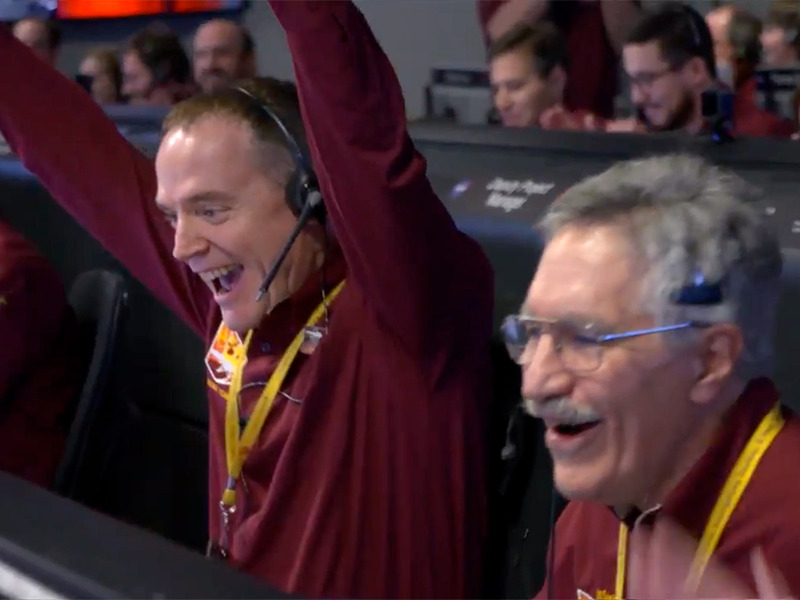 Scientists at NASA’s mission control in California burst into applause on Monday afternoon after the InSight lander safely touched down on Mars. Dozens of scientists at the Jet Propulsion Laboratory in California laughed, hugged each other, and engaged in wild handshakes to celebrate the first Mars landing in six years. Some NASA employees, including systems engineer Ravi Prakash, said they hadn’t shaved since the day InSight launched to mark the lander’s nearly seven-month journey to the red planet. And we have touchdown!!! Our @NASAInSight spacecraft has landed successfully on Mars! For some of the scientists, Monday’s landing was a dream years in the making. Bruce Banerdt, InSight’s principal investigator, has thought about studying the interior of Mars since his days as a graduate student roughly 40 years ago. Manning said he spent a lot of time visualising ways the mission could go wrong, but Monday’s landing was exactly what he hoped for. NASA JPL/YouTubeSome scientists had been working on the mission for years. Monday’s Mars landing was the first since NASA’s Curiosity rover reached the planet in 2012. Typically, about four or five years pass from the start of a NASA mission to a spacecraft’s launch. InSight, however, was delayed by about two years, said Michael Watkins, who was a manager for the Curiosity mission. While the InSight lander featured a similar design to an older, successful spacecraft – the 2008 Phoenix lander – it took longer than expected to build an accurate seismometer. 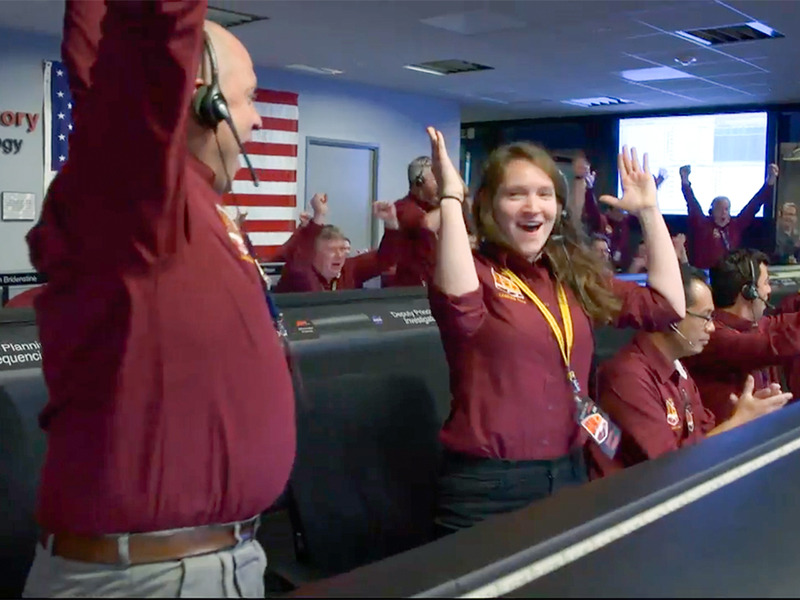 NASA administrator Jim Bridenstine said the atmosphere in mission control was intense on Monday afternoon, going from very quiet to celebratory once the good news was confirmed. As soon as the lander touched down on Mars, Bridenstine said he got a call from a number with all zeroes. He picked up to hear Vice President Mike Pence, who is the chairman of the National Space Council, congratulating NASA on a successful mission. “To have him call within seconds of mission success is tremendous,” Bridenstine said. NASA JPL/YouTubeInSight was the first Mars landing since Curiosity in 2012. Domenico Giardini, a professor of seismology and geodynamics in Switzerland, said scientists have worked toward this moment for the past 20 years. NASA is collaborating with several international scientists who will help analyse the interior of Mars, and Giardini said his team will look out for seismic events and meteoritic impact. NASA expects to confirm the deployment of the InSight lander’s solar panels around 8:30 p.m. EST on Monday. Afterward, the lander will study Mars for two Earth years, taking the planet’s temperature and checking for quakes.